The two-day workshop on echolocation for visually impaired persons was concluded with street demonstration. 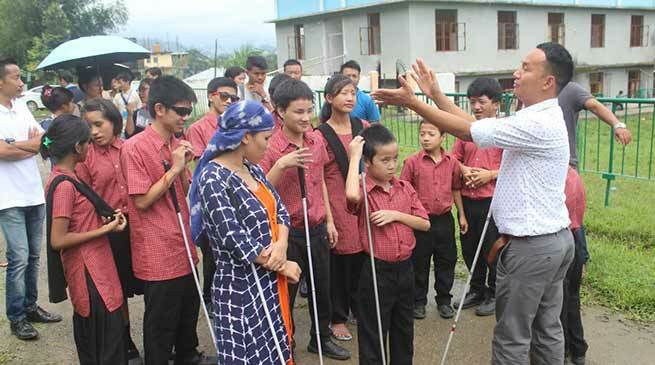 The two-day workshop on echolocation or flash sonar for visually impaired persons was concluded today with street demonstration here at the Donyi Polo Mission School for the Hearing and Visually Impaired here on today, Organised by the Education Development Organising Society (EDOS). The two days workshop was participated by the visually impaired students of the school and in demonstrations using echolocation or flash sonar to locate objects and navigate themselves. On second day of workshop, the resource person, Thomas Tajo from the ‘Visoneers for World Access’, informed that through echolocation techniques, blind people can click their tongues and clap their hand to “throw sound” towards an object. When the sound reverberates or Echo, it helps them to information about the distance, density and dimension of any object. The reflection of echo can help us to know about the distance of object. Which can help them to walk. the reflection sound also give information about the structure of object like large small soft etc. The acoustic reverberations give us a mental image of space and help us navigate. If you learn it, it is almost impossible to bump into a wall. Through this sound blind person can create mantle picture which can be help the blind person to walk. It is more convenient to use a cane instead of clicking your tongue towards the ground. You can also clap in traffic or noisy places. Combine all the techniques intelligently,” he said. Further he also said that within two days training the students learn many and they started can learning the echo of object and its distance , but it will be take time for properly learn. Mean while Kipa Nikmam, who joint today in the workshop said the she was learned many ideas from this workshop, through echo location process and our stick now we can get all the information about the every object.